I gave up my dream of playing professional golf when it was bluntly pointed out to me that I was rubbish, so I started work in a fashion-based recruitment company. I was there about a year when I was approached by one of my clients to join his new venture – a visiting tailoring company. I spent the day with him, watching him introduce his company to potential clients and doing fittings for his existing guys. I was hooked. There was the art of the sale; the education on how a suit should be made; advising on what cloths and style options would work best for that chap; and then, a few weeks later, there was this beautiful finished garment. It was a story from beginning to end, listening to the client’s wants and needs, their visions for themselves, and making it happen. There is nothing more satisfying to me than when a client puts on one of our suits or jackets and loves it. That’s an easy question to answer: passion, an amazing team, and coffee (lots of coffee!). I love what I do and I believe that if you are passionate about whatever you do, you’ll excel at it. I’m a people person and genuinely care about my client’s happiness with our service. I am proud of what we have achieved over the years, the client base we’ve built up, and the way we go about our business. We currently look after around 3,000 guys across the City, West End and Canary Wharf making their suits, smart-casual wear, shirts, coats etc, and have never been so busy. All of my team are also passionate about the brand and its values, and provide an exceptional level of customer service to their clients. They really do make my life easier by allowing me to concentrate on making the company better and better, making sure we are the best in our field, and looking for new and exciting ways to make DWIL even more special for our customers. Dress Well In London is a project I’ve had in mind for a couple of years now. 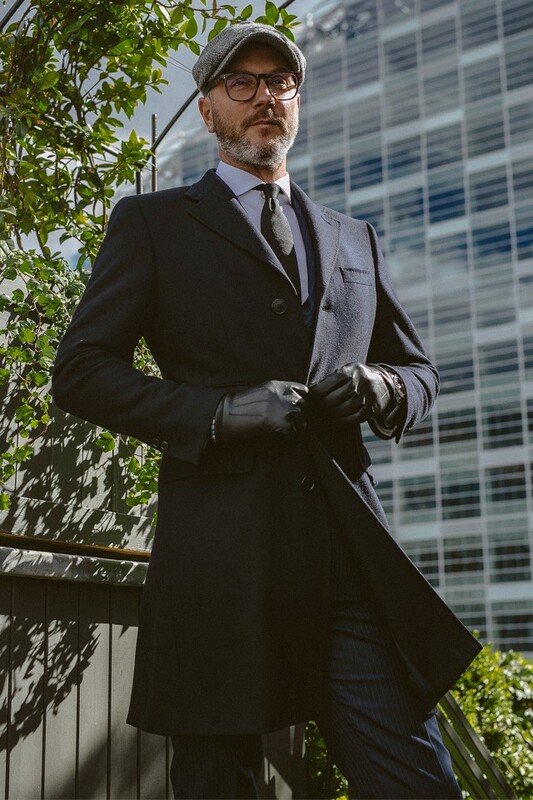 We are still providing the visiting bespoke tailoring service we offered with the James Palombo brand, however we want to add more bespoke and made-to-measure clothing and accessories to the brand. As well as the one-to-one personal service, we wanted to give our followers around the globe the opportunity to buy garments online in a made-to-measure capacity and a ready-to-wear range. Our suits and jackets have always been undeniably awesome however with the new brand we will be including a more complete range of clothing, shoes and accessories, all of a quality and style that is unsurpassed. It’s effortless. With the bespoke suiting I’ve always told my clients that it’s not how bold a check is, how bright the cloth is or how many different colour buttonholes you have that make a suit look great, it is always the fit! I wanted to bring that thinking to the rest of the wardrobe, whether it’s a pair of cords for walking the cobbles of Manchester, a raincoat for the coast of Cornwall or a pair of well-made Italian shoes for strolling down the King’s Road, I wanted to put together simple, well-fitting and stylish garments. All of these garments, accessories or shoes will be available in regular sizes but also fully bespoke, allowing the customer to make a great item more individual to them. Where do you see DWIL in ten years? Everywhere! No seriously, I have no idea. We enjoy making our clients look great and if we do a good job they will take us to where we hope to end up. I want to keep expanding the tailoring side but also find new ways of allowing as many people as possible to enjoy what we do and share our passion. The world has changed a lot since I started in this business but style is timeless. If you said to me ‘you’ll never be a bigger company but you will continue to be successful and make your clients really happy’ then I would take it. But I do believe that we have something really special happening here, and in ten years’ time I think that we will be dealing with a much bigger and broader client base. What’s been the toughest lesson you’ve learnt in business so far? God knows. There’s been so many that I’ve lost count! When I started JP it felt like every decision I made came back and hit me in the face, and I wouldn’t be exaggerating if I said that at least once a month that still happens. I’m learning every day and I expect that will always be the case. I am, however, very lucky I’ve met some amazing business brains through this job – some of them I now call friends. And when I meet with them through work or socially I try and learn from them. That’s the trick I suppose: making mistakes is OK, just don’t do it again. What brand or designer would you most like to collaborate with? Apparently collaborating with designers is hard work; I know I would probably be. However, I do really admire the portfolio of different items Tom Ford has put together. 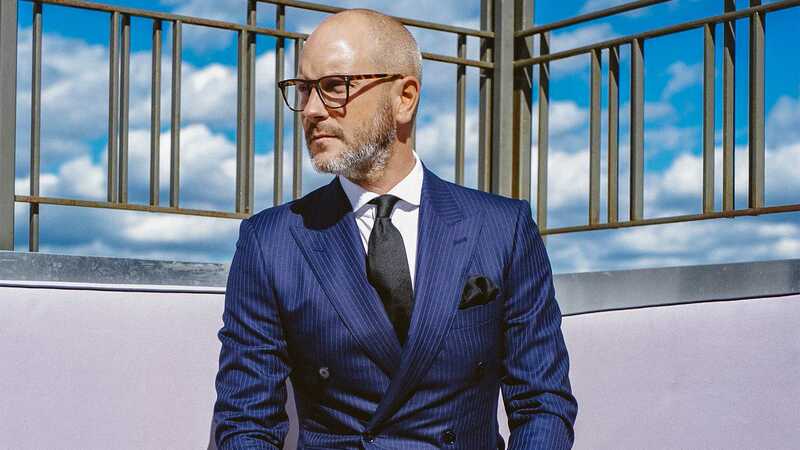 Everything he has turned his design team to – whether it’s suits, sunglasses, aftershaves – looks cool and exudes the statement of being a luxury brand. I would love to spend a few days with those guys; I’m sure that I would learn more than a thing or two. If you could make a suit for anyone, who would it be and why? The Rock. He’s just a cool dude, isn’t he? I made a wedding suit for a body builder friend of mine once, an absolute giant of a man, and it was one of the most challenging makes I have ever done. He has a 54-inch chest and 30-inch waist: my workshop thought I’d gone completely mad when I called that through. We got it done though and he looked amazing on his big day and I was sat there with a big grin on my face. I wouldn’t mind making one for my dad, either: scruffiest man on the planet! Forty years of sitting in a black cab and I think the fashion world passed him by. He’d only tell me off for wasting my money though. What three suits does every man need? I’m going to swerve that slightly and say that not everyone needs three suits straight away. A lot of our clients don’t wear suits every day to the office and so in order to build a great basic wardrobe I’d suggest a mix of suiting and smart-casual. 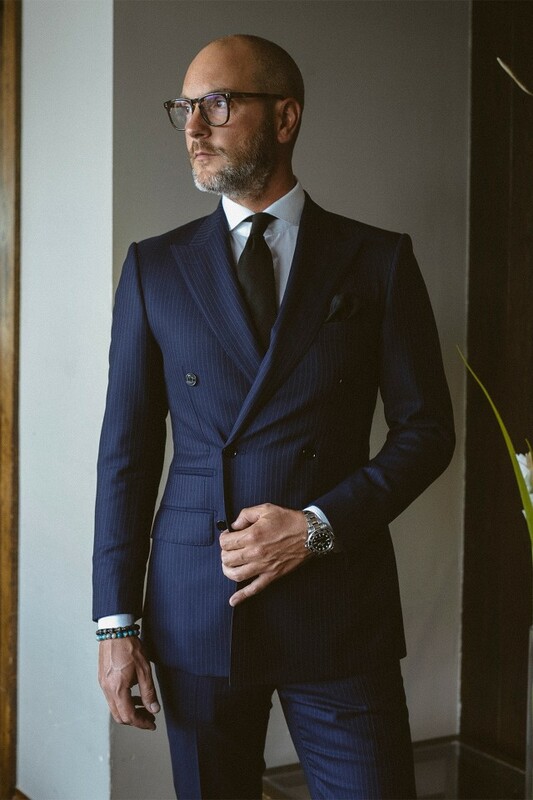 Firstly, a plain midnight blue suit is the most versatile of all: work, weddings, christenings and even funerals – it covers them all, and works with most shirts and ties. I would then suggest a blue, brown or grey sports jacket that will work with jeans, chinos and flannel trousers. A number of firms have introduced dress-down policies but this is no reason to dress like a slob. Lastly, I’m not going to say a dinner suit as one might expect. (How many of us go to more than one black tie event a year? You should have one but it’s not in my top three.) Instead, I would go for one of our ‘traveller’ suits. Something with a bit of a pattern in it but made with our highly regarded traveller cloth. It’s great for taking on business trips and can be packed without creasing. What’s the ultimate sartorial faux pas? Oh boy! There are so many, but then because of what I do I probably do notice more than most. There was a time when people were wearing the cloth label on the sleeve – that was a good one. Footballers with massive knot ties never looked good, either. More recently I’ve seen so many suits that are way too tight on people with the jacket length finishing just below their belt. It’s not a good look. Slim cut is absolutely fine – I wear it myself – but for the love of God, remember the suit is worn by gentlemen and no one needs to see your backside. Oh, and on behalf of all tailors out there, please wear decent boxers that keep everything in to a fitting. What suit will you never throw away? My first ever suit with my own label in it holds a special place in my collection. It is totally wrecked now but still takes pride of place on my clothes rail in the office. It was the proudest day when I put that on for the first time and I have to sadly admit to putting on the jacket only last week (I can’t fit in the trousers any more! ).